AnalogSampling strategy or data link complies with PJDLS v2.0, it is designed to communicate data wirelessly using light impulses and its sampling technique is based on analog readings. This strategy is able to use a single LED for both photo-emission and photo-reception phases providing with wireless half-duplex connectivity between devices with a range of up to 5 meters. Most appliances have at least a useless energy consuming LED on board, right? AnalogSampling can also be used with separate emitter and receiver pins enabling cheap long range wireless communication using standard photo-diodes, light-emitting diodes or laser diodes. The proposed circuit, technique and codebase were originally implemented in the far 2011, see the first video documented experiment. Take a look at the video introduction for a brief showcase of its features. Caution, mode 5 sets ADC clock prescale to a higher rate than manufacturer recommends as maximum ADC sample rate (prescale 16). 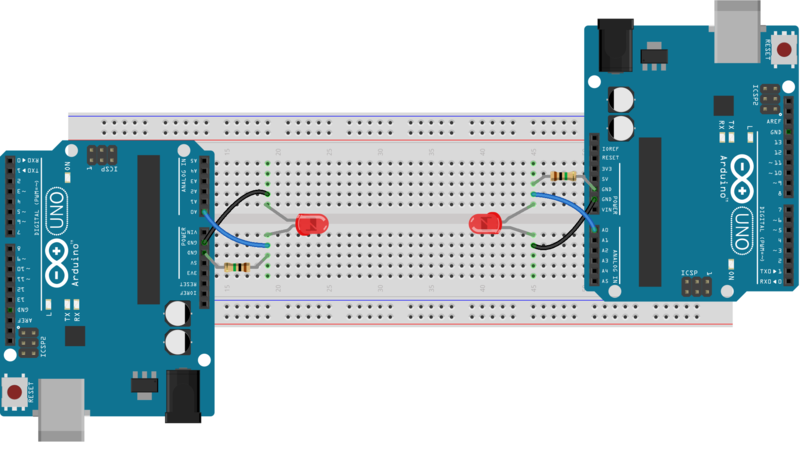 The most basic example is to connect two devices using a couple of visible light LEDs used as wireless transceivers. It is possible to use LEDs as wireless (bidirectional) transceivers. This means that wireless half-duplex connectivity can be provided by a single LED per device. See the LED selection guide to know more about how to choose the right LEDs and keep in mind that is necessary to add a 75K-5MΩ pull-down resistor connecting the pin used with ground to reduce the LED capacitance and externally induced interference and that depending on the voltage level used LEDs could be overpowered, add a current limiting resistor if required. AnalogSampling can be used to experiment with short range infrared or visible light communication (remote control, robot swarms, data streaming using lighting), medium range using light sources (cars transmitting data through front and backlights) or long range laser communication (data between ground and LEO). Pass the AnalogSampling type as PJON template parameter to instantiate a PJON object ready to communicate through this Strategy. All the other necessary information is present in the general Documentation. After the PJON object is defined with its strategy it is possible to set the communication pin accessing to the strategy present in the PJON instance. In all cases, when installing or maintaining a PJON network, extreme care must be taken to avoid any danger. When working with an AnalogSampling LED or laser based setup safety glasses must be worn and transceivers must be operated cautiously to avoid potential eye injuries. Consider that with AnalogSampling all LEDs that are physically connected to an ADC may be used maliciously to both download or upload data wirelessly, effectively circumventing many air-gapping techniques.